This course will introduce you to best practices for inspection, testing and maintenance of fire detection, alarm and suppression systems to assure reliable and effective operation in emergency situations. You will be introduced to the principles of Reliability Centered Maintenance (RCM). Learn test discrepancy limitations that can result in a fire suppression system being out of conformance with acceptable measures of reliability. This course is intended for mechanical, electrical and fire protection engineers and other design, operation and maintenance personnel responsible for the reliability of fire detection, annunciation and suppression systems and equipment. This course will give professional engineers and operation and maintenance personnel guidelines for inspection, testing and maintenance of fire suppression systems. 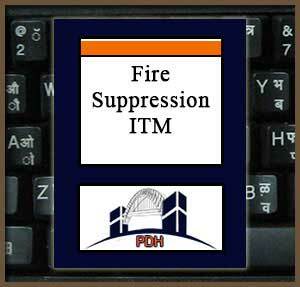 This is an introduction to testing, maintenance and inspection methods for fire suppression systems. This course will give you an introduction to inspection, testing and maintenance procedures for fire suppression systems for buildings and related infrastructure.